Valentines Day and … Meatballs? Makes about 12 (2-inch) meatballs. Serves 4. Combine the pork, beef, garlic, breadcrumbs, cheese, parsley, oregano, salt pepper and red pepper flakes in a bowl. Add the egg and mix in with your hands. Lightly form into 2-inch meatballs. Place on a plate, cover with plastic, and refrigerate for 1 hour. Heat 2 tablespoons olive in a deep skillet over medium heat. Add the meatballs in batches, without overcrowding. Brown on all sides, turning gently with tongs or a spatula. Remove and set aside on a plate lined with a paper towel. When all of the meatballs are browned, pour off the oil. Make the sauce: Without cleaning the skillet, add 1 tablespoon olive oil. Add onion and saute until softened, 3 minutes. Add garlic and saute 1 minute. Add wine and cook, scraping up any brown bits, until reduced by 2/3. Add tomatoes, breaking them up with a spoon. Add tomato paste, oregano, salt and pepper. Return meatballs to the skillet. Cover and simmer over low heat until the meatballs are cooked through, about 30 minutes. Bring a large pot of salted water to a rolling boil. Add spaghetti and cook unitl al dente; drain. Serve spaghetti with meatballs and sauce ladled over. Garnish with basil leaves and grated cheese. Oh my gosh, that scene in Lady and the Tramp is one of my all time favorites. I’m like you as far as sweets go. I make a lot of them for others, but I’m big on savory and spaghetti and meatballs is a special dinner to me too. and I started to smile even before I clicked on the link of the Lady and the Tramp, as that is my favorite scene and I knew you would link to it… very very cute! Thanks for the recipe, and the smile! I had just finished early lunch ere coming back to the computer. Guess what: I had curried lamb patties with pasta 🙂 ! Had to smile at that and the recollection of that delightful scene in ‘Lady and the Tramp’ which is in front of my eyes even without having as yet clicked on the link! Uhuh, I may be romantic, but also in a very svoury way! Thanks for the smile 🙂 ! 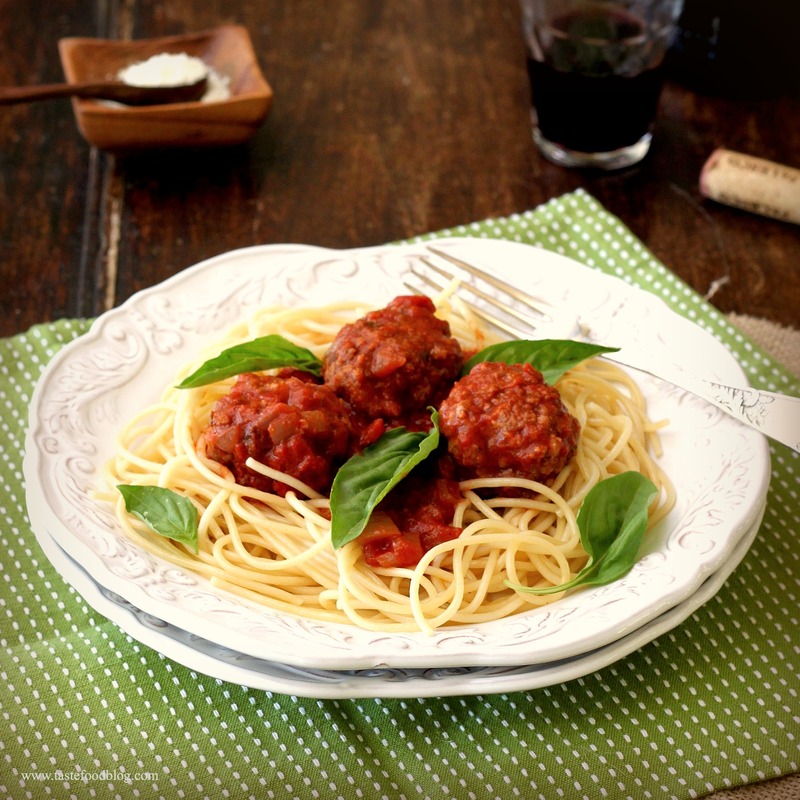 Is there anything more romantic than spaghetti and meatballs? I think not! I like savory and sweet! I much prefer a home cooked meal over fighting the crowded restaurants on Valentine’s Day and Spaghetti and Meatballs would surely be a splendid dinner!